When I was little, I would consider geeks the individuals who were interested in math and science and nerds the individuals who were interested in history and literature. It also meant (and still does to a point) that someone was very smart, because all of my geek/nerd friends had high IQs, were in the gifted programs, or excelled in most subjects. I pretty much stay with that, but I've also started seeing that my nerd-ness isn't just because of academics, but is also because of some of my favorite things to do. But basically, it comes down to being an individual. Geeks/nerds are all unique. Reading (can I say that twice?). Reading: I am an avid reader. In school, I was always above my peers reading level. In the fourth grade I read Les Misérables and loved it. I had already read through quite a bit of Edgar Allan Poe's works. Reading is a major stress reliever for me. When I'd face bullies in school, I would just get lost in the pages of some fantasy novel or 19th century novel. I always encourage people to read. If someone says they don't have time I work out a way for them to be able to. Gaming: I think gaming falls in line with reading. I would use gaming to escape bullies or stress. I still use it to escape stress. I like a wide variety of games, but my absolute favorite is Tomb Raider. I have played through every TR game multiple times. Reading: ... see above :D (I'm REALLY passionate about reading.) I'll add here that in undergraduate work, I took every single literature course my college offered. People thought I was insane because of all the reading, but I LOVED every minute of it. Ed. note: While I didn't take every course UMass offered, I did take a lot of them. And I used to go to the bookstore each semester and buy extra books from the ones that sounded interesting that I couldn't take. So I definitely understand this love. Music: I've played piano since 3rd grade and I have an accordion I am learning to play. I hope to one day be able to play multiple instruments. Again, it is another source of stress relief. I play a few Beethoven pieces and I am relaxed. As an introvert, I've become very passionate about things that allow me to recharge. Music is definitely one of those things. I listen to just about everything and I have my bands that I will always love and bands that will always calm me down right before a huge exam. TIM BURTON! What can I say about Tim Burton? He has been a major encouragement in my life. Through watching his films, I learned it was OK to be an individual. I remember when he wasn't very popular and most kids in my school hated Nightmare Before Christmas. That movie was, and is, my favorite Disney movie and while other girls said one day they'd find Prince Charming, I said one day I'd find my Jack Skellington. My first tattoo was Jack Skellington and I have several other Burton inspired tattoos planned. My parents bought me his art book when it came out, but it took awhile to come. It came on the night before my wedding. I cried so hard and I am not a crier. And I am slowly learning Nadsat. Ed. note: How cool! I am terrible at languages, but would love to learn a fictional one. A Dance with Dragons for a book/Harry Potter and the Deathly Hallows for movie/Game of Thrones for TV. I don't have any particular book I am waiting for this year, but I am excited to start a new series/FRANKENWEENIE for movie/Game of Thrones for TV/The NEW Tomb Raider game!!! EEE! That I LIKE to visit or am ADDICTED to? I also visit my graduate school's email/portal site every day, but I don't like to. Ed. note: Lydia just recently graduated! Big ol' congrats to her! Do you have a blog/website/Twitter name/etc. that you'd like to share? 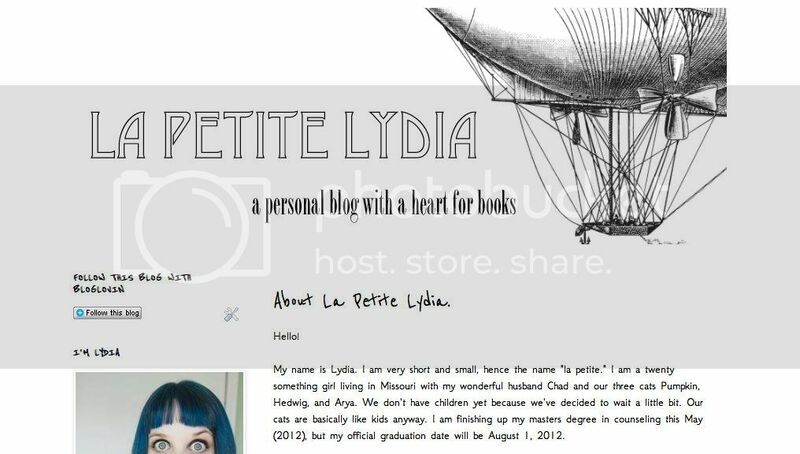 Blog is: lydiajdavis.blogspot.com and I don't have a Twitter. I do have instagram, on which my username is lapetitelydia. Any additional comments or thoughts? 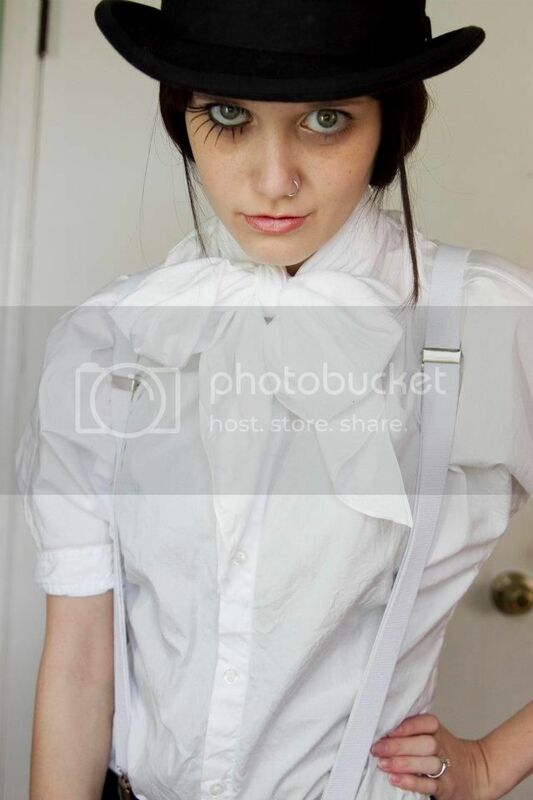 Halloween is my favorite holiday and I firmly believe you cannot have only one costume. 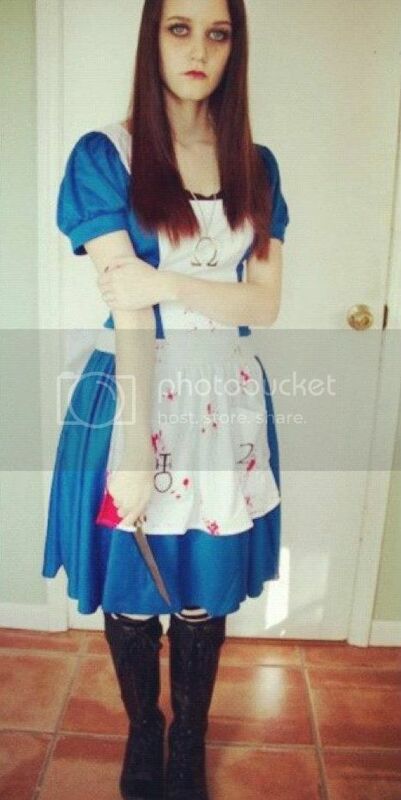 Last year I was Alex from A Clockwork Orange and Alice from American McGee's Alice. I'm a cat person and have three cats: Pumpkin (I named her when I was 9 ... I loved pumpkins then and I still do), Hedwig and Arya. I'm married to a wonderful guy who happens to be a math/music nerd. We love spending time together by playing video games such as Star Wars Battlefront or just playing separately. We're both introverts, so we understand the necessity of quiet. You mentioned you turned to reading and games as a way to avoid bullying. Did you have other ways that helped you cope/helped you rise above? Those ways were ways I eventually learned. I had been a self-injurer, that was how I dealt with the bullying. One day I realized that when I played video games or read for several hours I wouldn't self-injure and would live a healthy life. So, I worked to stop self-injury and replaced it with gaming, reading and music. So really, gaming and reading are what helped me cope later on. It is a much more detailed story, but that is the basic outline. Other things that helped me overcome were my friends and family who were tremendous encouragements in my life, I turned to a relationship with God as a healing point in my life, and as silly as it sounds, Tim Burton helped me too. Seeing how much of an individual he was helped me realize it was OK. On some of my roughest days I would watch film after film of his. Tim Burton means a lot to me. More than that he is talented, but that he helped me overcome my insecurities and the feelings I encountered with bullying. I realized he was most likely bullied in school, but look at where he is now! He really encouraged me. I wish that one day I will be able to tell him how much of an impact he has made on my life. Ed. note: Thank you so much for sharing this, Lydia. I'm so glad you've been able to overcome! Are you able to choose a favorite Burton movie? If so, why is it your favorite? Favorite Burton movie ... AHHH! How can I choose? I love them all for different reasons. I guess I'll go with Nightmare Before Christmas. That was my introduction to Burton. The next film of his I watched was "Vincent" and that is my favorite of his short films. Nightmare Before Christmas has been a huge part of my life. 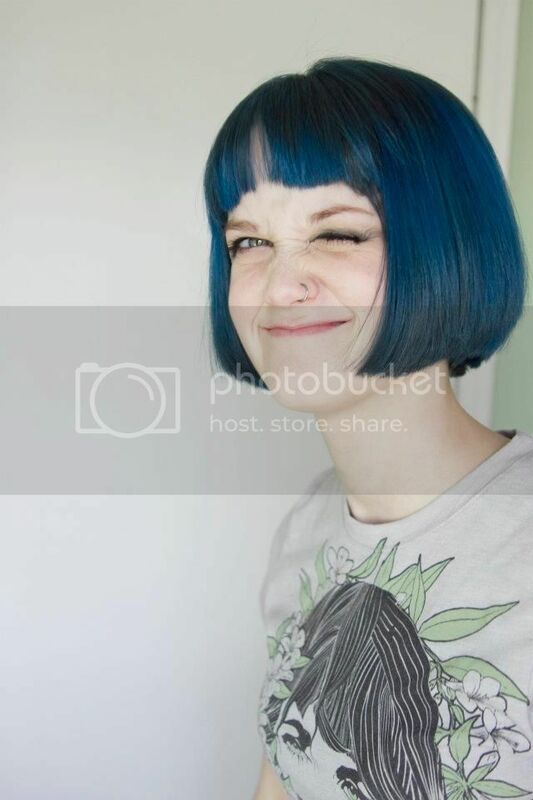 My nickname is Sally. 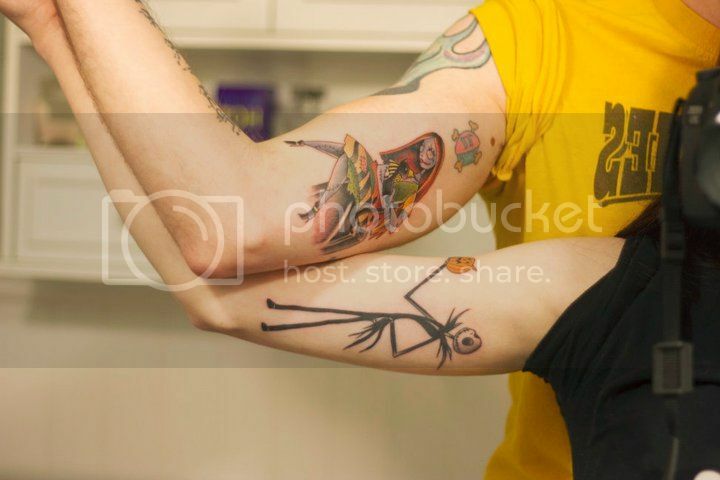 My husband and I have Jack and Sally tattoos (I have Jack he has Sally). 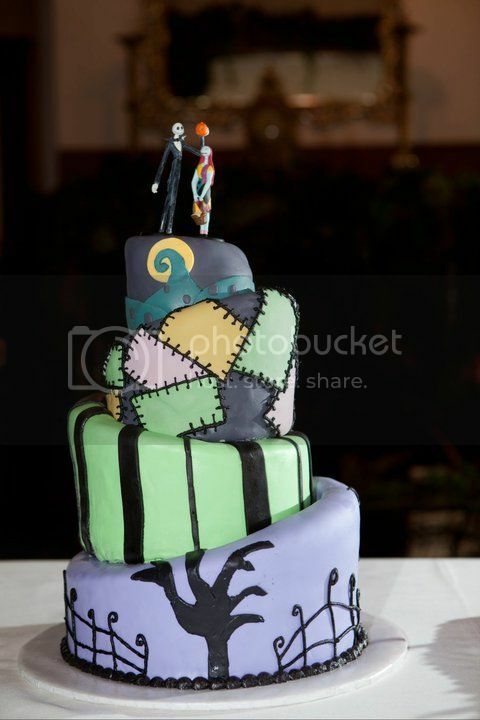 Our wedding cake was Nightmare Before Christmas, we even had an extra cake that was Jack's graveyard. So, yeah. I'll go with Nightmare Before Christmas. 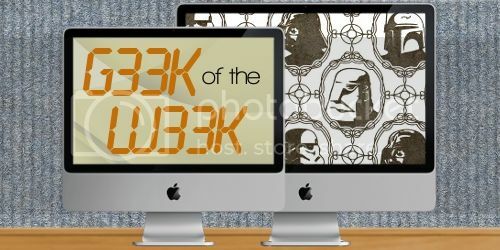 Thanks, Lydia, for being a Geek of the Week! LYDIA!!! You are SO awesome. Gonna go follow your blog right now - I think we'll get along wonderfully! Loved reading Lydia's answers! 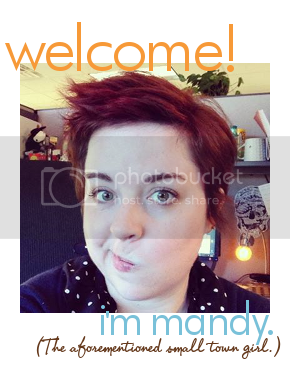 She's quickly become a good friend thanks to the ol' blogosphere :) Thanks for featuring her, Mandy! Snow White and the Huntsman—a giveaway! obsessed. : "Ho Hey" and "It's Time"